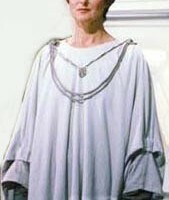 Mon Mothma a native of Chandrila, was a female Human who served as an important political figure from the waning days of the Galactic Republic, one of the founders of the Alliance to Restore the Republic, and the first Chief of State of the New Republic. Ivory or cream colored over dress or poncho made from a soft, natural, textured fabric, with a jewel-neck collar. The fabric should be heavy enough, or be lined, so that the under dress does not show through. The length of the outer garment must be at or just below the knee. Armholes are formed from the body of the outer garment by joining the front and back pieces under the wrist. The sides should be knuckle length before being pulled up to just above the wrist with a large sleeve fold that is tacked down just below the elbow. Outer garment should be full enough to ensure that inner garment does not show at the sides. Deep brown under dress, made from a soft, natural fabric such as jersey, with a full gathered skirt. The sleeves must be tight fitting and gathered at the wrists. A skirt and shirt is also acceptable. A necklace consisting of two thick dull gray twisted/roped cords, with a round, silver pendant, detailed as it appears in the movie, suspended in the center from four smaller cords twisted together; one a thin grey roped cord, one cream or ivory, one white, and one black or dark brown. The necklace should be attached at each shoulder and end with the gray cord wrapped around a small, domed object, such as a button, with single strand of the large gray cord around the back of the collar. Flat or low heeled (1 inch/25cm or less) brown shoes or boots. No visible laces, buckles, or zippers, no spike heels. Appropriately-styled hair shorn above the collar; naturally-occurring hair colors only.